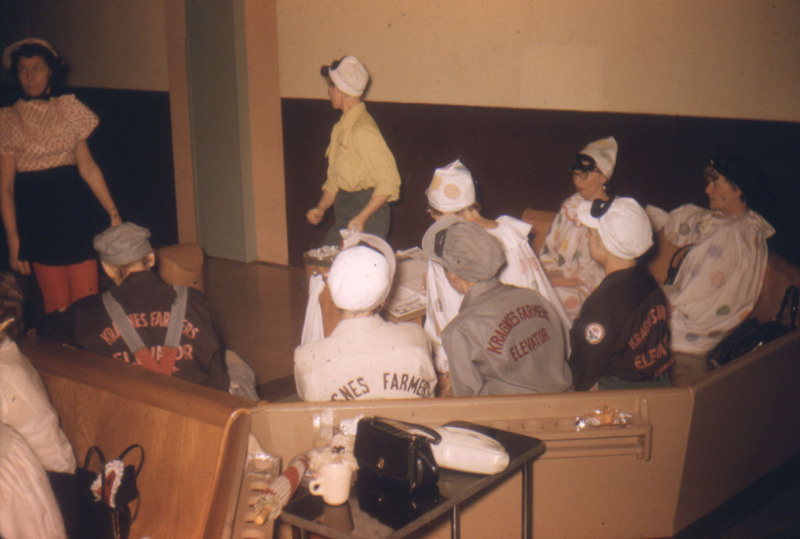 On the evening of October 31st, 1960, the gals from the bowling league got together and tossed the balls a few times. Being Halloween, they couldn’t go without a costume, of course: some made due with just a black mask, but others got into it more. I see a couple clowns, a railroad engineer, and a Bo Peep. 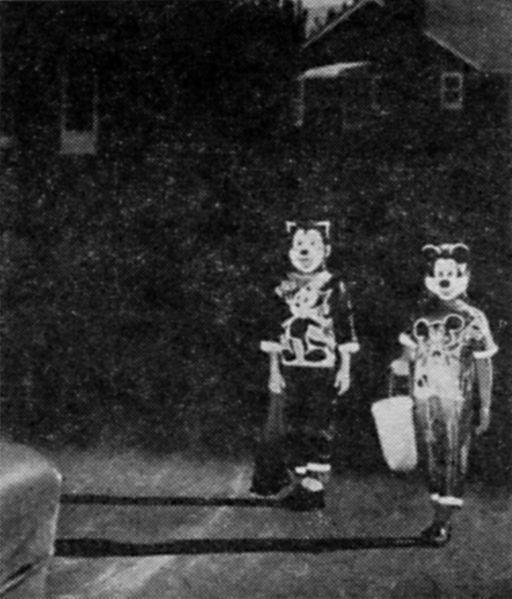 Felix the Cat and Mickey Mouse have been ‘reflectorized’, according to this article from 1960 on Halloween safety. You may think your parents were the first ever to be so lame as to worry about cars running over little Batmans and princesses on your neighborhood streets, but the worry has been around about as long as cars (but probably moreso about the time the suburbs began to flourish). My only thought about this picture is that it doesn’t actually depict Halloween: in order to be included in the October 15th issue, the article and photo probably had to be in to the publisher by the 1st, and with photo developing time the picture was probably taken sometime in September. Imagine you’re the two kids, dressed in your Halloween costumes a month early, walking around your neighborhood decked out in high-reflective tape, during the first couple weeks of school. Downright embarrassing. 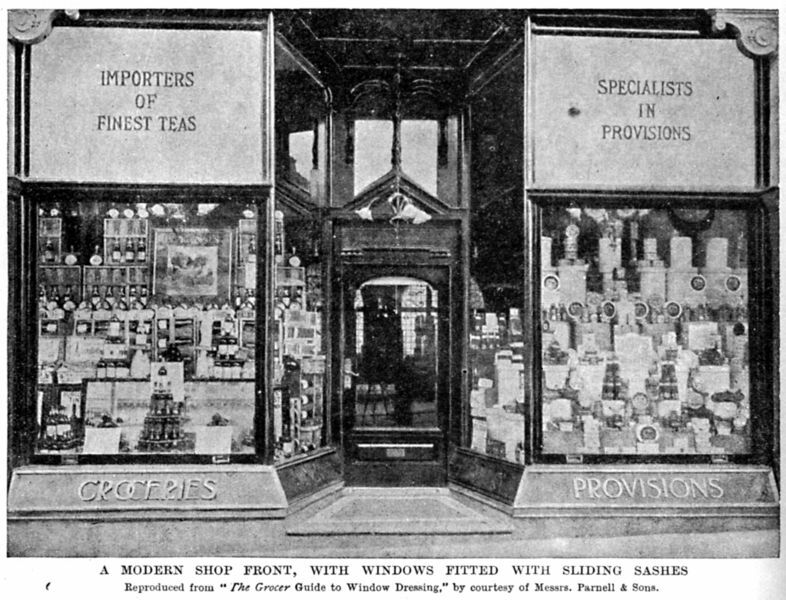 Caption reads, “A modern shop front, with windows fitted with sliding sashes.” The ’sashes’ are the front two large-paned windows facing the street (the grips are visible along the bottom edge of the window). The sash is fitted with a sash-weight to counteract the enormous weight of a sheet of glass this size. The sash slides upward to open, allowing street-side sale of groceries during times when the weather allows and closing up during inclement weather. The caption reads, A good example of high-class window dressing with a proprietary article. 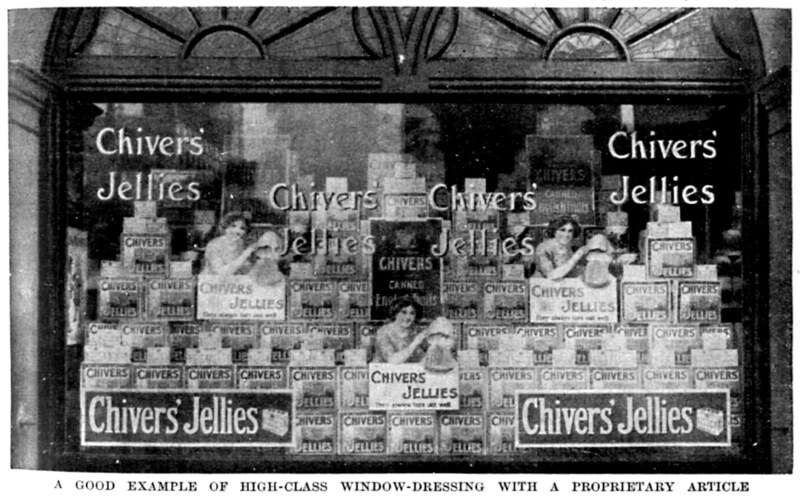 That proprietary article is Chivers’ Jelly, preserves from a UK company that still happens to be around — albeit now part of an international conglomeration and located in Ireland. 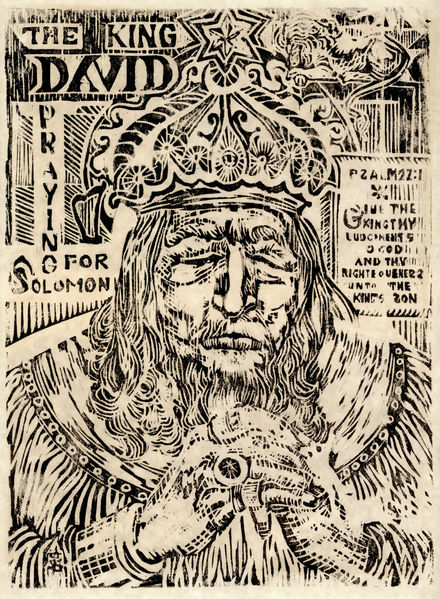 The King David Praying For Solomon, a woodcut by Shirley Swenson. 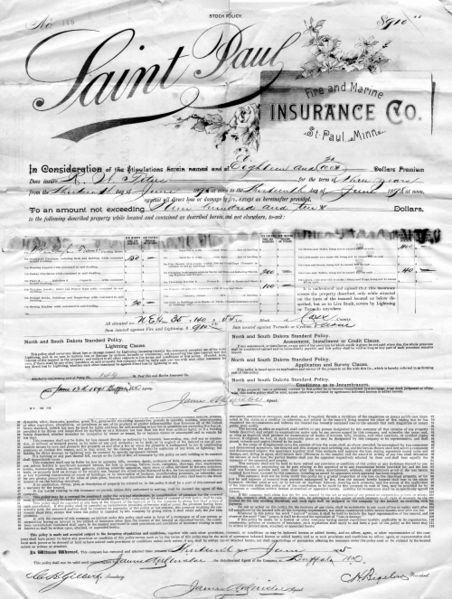 Note the reversed letters on the right (would be the left side of the printblock). 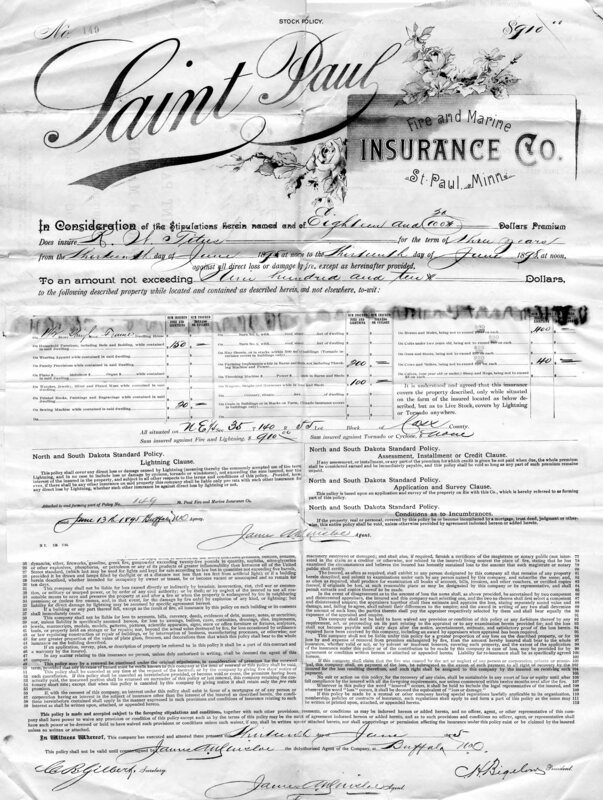 The print is not dated nor numbered, but it is quite clearly an original hand-printed piece of art. The size of the woodcut was huge — 13″ x 18″, and carries enormous detail. It was poorly mounted in a cheap frame, and the materials used seem to date to the 70s or 80s. According to a note on the back, Shirley Swenson was the daughter of Cora Swenson of Libby, Montana. No other information is available. We purchased it for $15 at the Moorhead Salvation Army thrift shop. 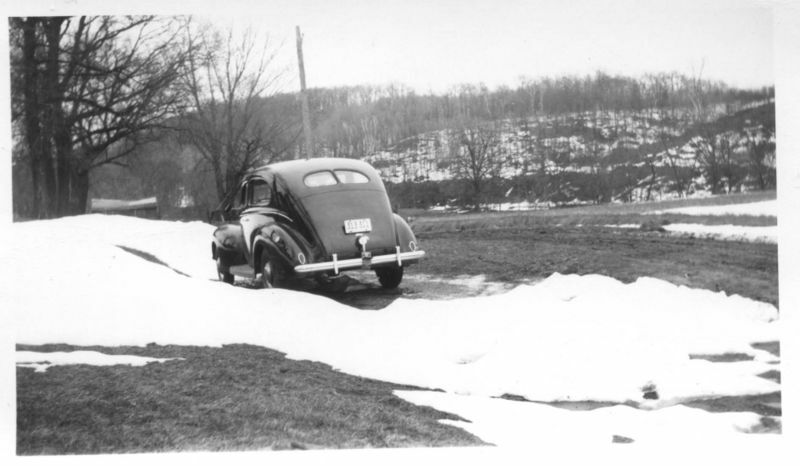 Car parked in the snow, appears 1930s. You are currently browsing the The Infomercantile blog archives for October, 2008.